Cody Freeman is the Managing Director and Head Designer of Twisted Designs. He has over seven years experience in balloon art and entertaining and has performed in 9 countries throughout 4 continents at festivals, parties, corporate functions and on the streets of some of the most famous cities there are. Prior to starting this company Cody was at university completing a Bachelor of Science with a double major in Mathematics and Physics. Cody's childhood was a mix of India and Australia, going between the tranquil rainforest in Kuranda in the Far North of Queensland Australia, and the happening tropical beaches of Anjuna Beach in Goa India. 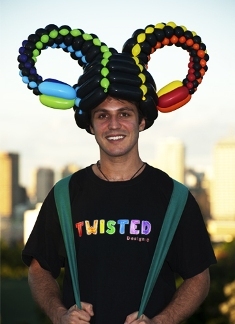 The child of successful parents Don and Judy Freeman, the creators of the very renowned Tjapukai Aboriginal Cultural Centre in Cairns, it is in his blood to be a performer and he is taking the field of balloon art entertainment into uncharted territories.